Audi has debuted many vehicles at the Geneva Auto Show this year. 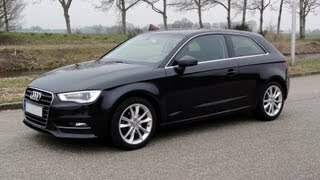 One of the most eye catching of them has been the 2013 Audi A3, which is the lighter and more efficient variant of the older A3 hatch. The changes incorporated in the new A3 are quite stark compared to the older one and it will compete in the market against BMW 1 Series, Volvo V40 and Mercedes Benz A-Class. 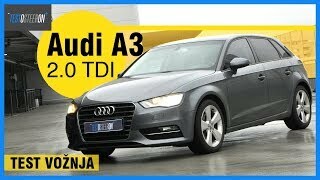 The older A3 was a car with quite a long history and popularity. Since the new A3 would now be replacing such a popular vehicle, Audi has done everything it could to make it a perfect replacement. It has loaded the new A3 with various new technology and gadgetries. Customers will be given three different engine options with the new A3 – a 1.4 liter TFSI, a 1.8 liter TFSI and a 2.0 liter TDi Diesel engine. The 1.4 liter TFSI produces a max power of 122 HP, whereas the 1.8 liter TFSI produces a max power of 180 HP and the 2.0 TDi diesel gives out 143 HP. Later on Audi also plans to offer a 1.6 liter TDi and a hybrid engine with the 2013 A3. The 1.4 liter TFSI and the 2.0 TDi diesel engine will be mated to a 6-speed manual transmission, while the 18 TFSI will have a S-tronic 7-speed automatic transmission. As far as performance is concerned, the A3 variant fitted with the 1.4 liter TFSI will achieve 60mph from zero in just 9.3 seconds and have a top speed of 126.14mph. These figures for the 1.8 liter TFSI and the 2.0 liter TDi stands at 7.2 seconds/144.16mph and 8.6 seconds/132.16mph respectively. Fuel economy figures for the base model stands at 45.23 US mpg, whereas for the 14 TFSI and the 2.0 TDi it is 42.00 and 57.37 US mpg respectively. 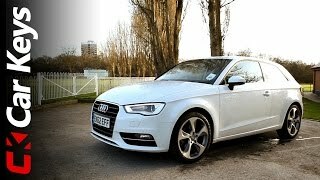 Although many things about the 2013 A3 is completely new, the dimension of this three-door hatch is till the same as the older one. In the front the car has been given a single frame six-cornered radiator grille and a newly designed hood. The front bumper now has larger and revamped air intakes and newly designed LED headlamps. Audi will also be offering Xenon lights as an option to the customers. A sharp tornado line runs along the side of the car just above the sills. 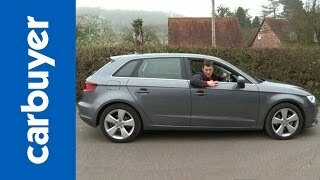 This is another new design feature that has been seen in this A3. The 2013 A3 has split LED taillamps. Like many of Audi’s launches, the A3 will not be launched in US. For now it will only be available in Europe. The car will go on sale in Germany this spring and will have a starting price of 21,600 euros ($28,500). The trailblazing Audi hatchback credited with filtering the premium feel-good factor through to the compact class is about to raise the stakes yet again as the all-new A3 debuts in Geneva with an evolutionary new look and revolutionary leaps in quality, technological sophistication and driver appeal. The third generation of the three-door model is the first to break cover in Switzerland, and will open for UK order in spring priced from approximately £19,000 ahead of first deliveries in September. CO2 emissions of as little as 99g/km in the new A3 have been made possible with the help of ‘Audi ultra’ lightweight technology, which has enabled it to tip the scales an impressive 80 kg lighter than its predecessor. The aluminium front wings and bonnet help in this regard, and contribute to a class-beating kerb weight of just 1,175kg for the 1.4 TFSI model. In terms of dimensions, the new A3 is virtually identical to its predecessor in length and height at 4,237mm and 1,421mm respectively, but it features a longer 2,601mm wheelbase in the interest of dynamic composure and interior packaging. It is also slightly wider at 1,777mm. The single-frame radiator grille that is typical of Audi dominates the look of the front end, and as before in higher specification models it is flanked by xenon headlamps with LED daytime running lamps, the latest versions featuring a new ‘clasp-like’ solid band which surrounds more of the lens. These will also be optional for other models, and wherever they are fitted the tail lights will also be equipped with LEDs. In the longer term, full LED headlights will also be available, and will be a first in the compact car segment. In profile, the pronounced tornado line – a classic element of Audi design – gives structure to the area below the windows, and above the sills a dynamic line rises sharply upward. The gently sloping C-pillars and the roof that sweeps back into a modest spoiler lend the car a distinctly coupe-like air. At the rear the spoiler edge above the diffuser emphasises the width of the new premium compact, and the inner architecture of the split tail lights is a variation on the headlights’ theme. The tailgate has a sculpted, three-dimensional look, and below it in the diffuser insert are either one or two tailpipes on the left side depending on the engine type. Another technical area in which the new Audi A3 will excel is in its new high-performance driver assistance systems. They range from radar-assisted adaptive cruise control to Audi side assist, Audi active lane assist, traffic sign detection, park assist and the Audi pre sense basic safety system. In the infotainment area too, the latest A3 raises its game significantly with features such as a new optional A3-specific Bang & Olufsen audio system, MMI navigation plus and mobile phone preparation with online services, which brings new ‘real time’ online traffic information and, through a WLAN hotspot, gives passengers access to the Internet while travelling. The new Audi A3 will launch with three four-cylinder engines, all of which are essentially new developments. The 1.4-litre and 1.8-litre TFSI engines and the 2.0-litre TDI have outputs of 122PS, 180PS and 143PS respectively. Compared with the previous model, they offer fuel economy improvements averaging 12 per cent. The 1.8-litre TFSI is linked as standard to a seven-speed S tronic twin-clutch transmission; the 1.4-litre TFSI and 2.0-litre TDI are paired with a six-speed manual gearbox. All engines in this first phase drive the front wheels; quattro permanent all-wheel drive – and further engines, including a 1.4-litre TFSI with innovative cylinder on demand technology – will follow later in 2012. The completely new A3 chassis has been designed with an optimum balance between comfort, composure and driver appeal in mind. It works with a finely-tuned power steering system with a highly efficient electromechanical drive and an Electronic Stability Program integrating an electronic limited slip differential which makes handling even more fluid and safe at performance limits. The optional Audi drive select system lets the driver vary the operating characteristics of key components, namely the steering weighting, the throttle response and the transmission shift points (where S tronic is fitted). It can also be upgraded to incorporate control of the optional Audi magnetic ride system with its magnetorheological fluid-filled dampers.